Product prices and availability are accurate as of 2019-04-24 12:28:17 +08 and are subject to change. Any price and availability information displayed on http://www.amazon.com/ at the time of purchase will apply to the purchase of this product. 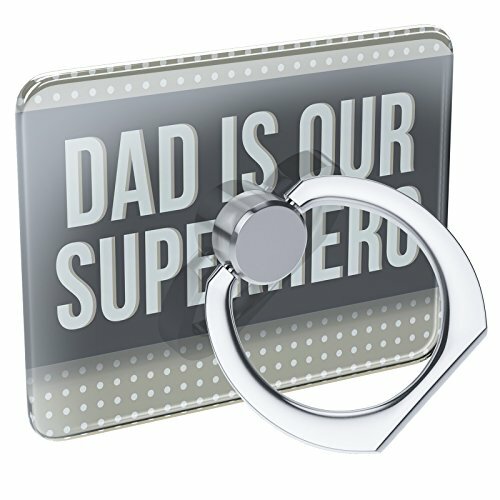 Give this cell phone ring holder to your super dad's birthday. On the ring holder, it is printed with "Dad is our Superhero" message. Your superhero dad will definitely feel proud and happy to receive this little but meaningful birthday gift. 360° rotation and 180° flip allow you optionally adjust your phone to different viewing angles to chrome page or watch videos, benefit to touch more spots on phone screen and conveniently operate. Widely Compatibility: NEONBLOND cell phone ring holder suitable with most devices and all phone case, such as iPhone X 8 Plus 7 6s 6 SE 5 5s, Samsung Galaxy S8 S7 S6, Note series, LG, Tablets and iPads and more Stick tightly, and gives you more security and stability when holding the device so you've less chance of dropping it Provides pretty and special instead of plain and unpersonalized Cellphone. Printed in Atlanta GA, Thank you for supporting small business your NEONBLOND team!